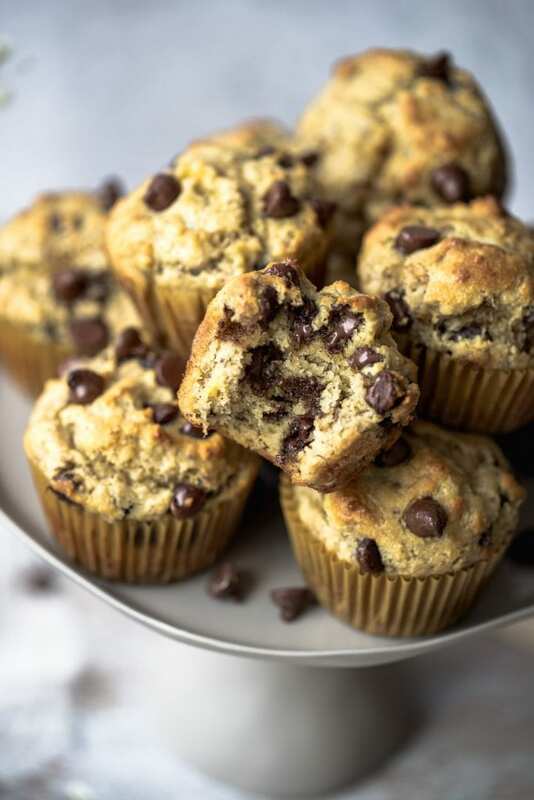 Almond Flour Muffins made with Chocolate Chip are sweetened with banana, studded with melty chocolate chips and can be whipped up in 30 minutes! Just another #MuffinMonday over here on the blog! AKA my favorite day of the week. You’re too, right?! I’m happy to say these almond flour muffins are a great treat any time of the day. You can enjoy them first thing in the morning with your coffee or tea, as an afternoon snack warmed up and enjoyed with almond or peanut butter, or even as a treat in the evening with a little ice cream. Whatever way you choose to enjoy it I know you’ll love this one! Ripe bananas: I chose to add sweetness with ultra ripe bananas, but you can also swap the bananas out for 1/3 cup honey, maple syrup or your favorite sweetened of choice. Almond flour: The key ingredient for this recipe! I prefer to use Bob’s Red Mill. Cake flour: Only 3/4 cup. But using this cake flour adds a wonderful texture that you won’t want to skip out on. Gluten free? Use gluten free flour to replace it. You may need to add xanthan gum as well if you use the GF flour. Milk: I use cow’s milk, but you can use almond milk or any milk you prefer – even coconut milk! Coconut oil: I enjoy baking with coconut oil because it makes the resulting product taste a bit lighter and you can taste that nice touch of coconut. Coconut oil can be substituted one for one with butter in most baked goods if it calls for it. Flaxseed: I love to add it for a nutritional punch! 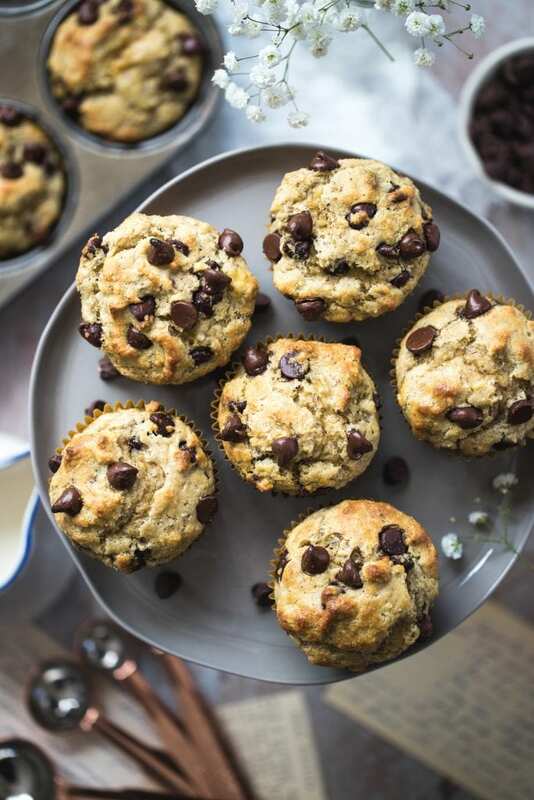 I love that these muffins are made with whole food, real ingredients and are still insanely moist and satisfying! I hope you feel the same way! After some research, I have found a great way to get a beautiful color on the outside of your muffins as they rise, and also cook the entire center. The secret? Bake your muffins first at 425 degrees F for 8 minutes, and then lower the temperature down to 350 degrees F for another 6 or until a toothpick inserted in the center comes out clean. Also they help of the baking soda helps! 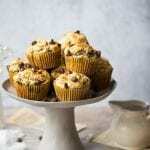 How long do these almond flour muffins last? You can keep them in a zip lock baggie on your counter at room temperature for up to 5 days (if they last that long!) Or in your freezer for up to 3 months. Are these muffins gluten free? They can be! Almond flour is gluten free, but the addition 3/4 cup of cake flour is not. You can use a gluten free flour in place. Like mentioned above, you may need to add xanthan gum as well if you use the GF flour. Can I make these muffins vegan/paleo? To make vegan, you will need to use almond milk or another non-dairy milk and then also use an egg replacer. 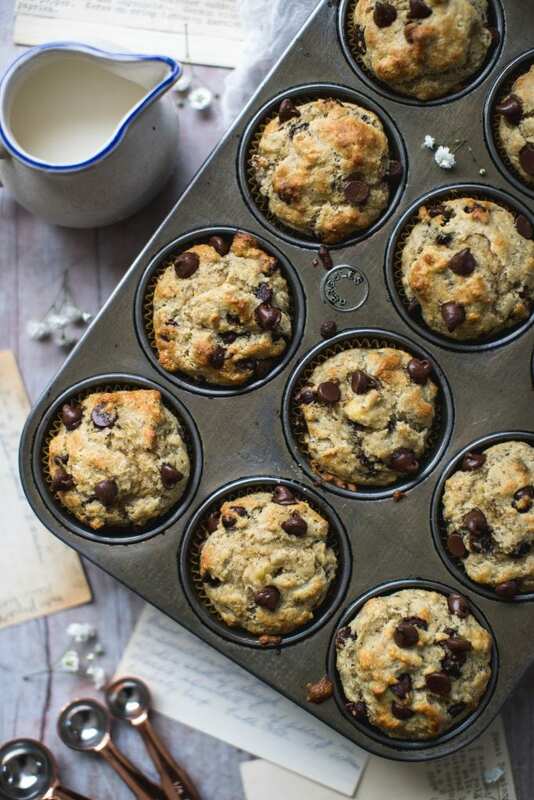 I haven’t tried using an egg replacer in this almond flour chocolate chip muffin recipe but a chia or flax eggs can work, just know it may not rise as much. Also be sure to use dairy free chocolate chips! This recipe is paleo friendly since almond flour is lower in carbohydrates than other flours. If you’re into this recipe you’ll also love these Chocolate Banana muffins and these Maple Snickerdoodle Muffins! Preheat the oven to 425 degrees F. Line a cupcake tin with liners and set aside. In a medium bowl, mix together the dry ingredients: flours, flaxseed, baking soda, baking powder, cinnamon and salt. In a separate bowl, whisk together the mashed banana with the eggs, milk, coconut oil and vanilla until combined. Fold in the dry ingredients into the wet and then gently mix in the chocolate chips. Divide batter into cupcake liners and top with additional chocolate chips if you’d like! Bake for 8 minutes at 425 degrees F. Then lower the oven temp down to 350 and bake for another 6 minutes or until a toothpick inserted in the center comes out clean. Let cool for 5, then enjoy! What a great breakfast option or after school snack! These look so sweet and perfectly moist; yum! These muffins look and sound delicious! I’ve never used almond flour for baking. I really should try it! 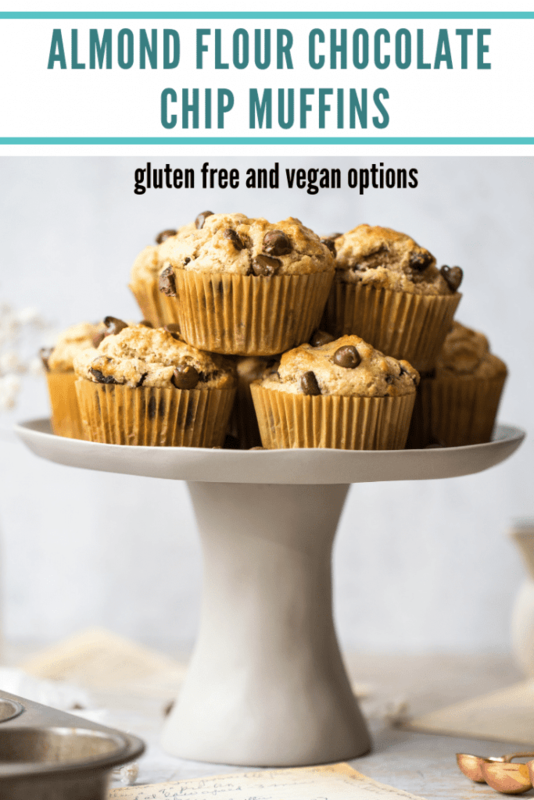 Great that you add tips for making them gluten free or vegan! I love that you posted this! I have almond flour that I bought and now I don’t know how to use it. I will make these with my daughter this week. I want to try these! I love that they’re higher protein with the almond flour. Perks of almond flour!! Thank you so much Annemarie! I made these muffins for breakfast this morning, and O.M.G. were they delicious! Thanks so much for sharing! Aw thank you so much, I am so happy you loved them!! Cute, perfect and delicious. Best for my Kids Birthday planning option. Thank you so much, I hope they are a hit at the birthday!